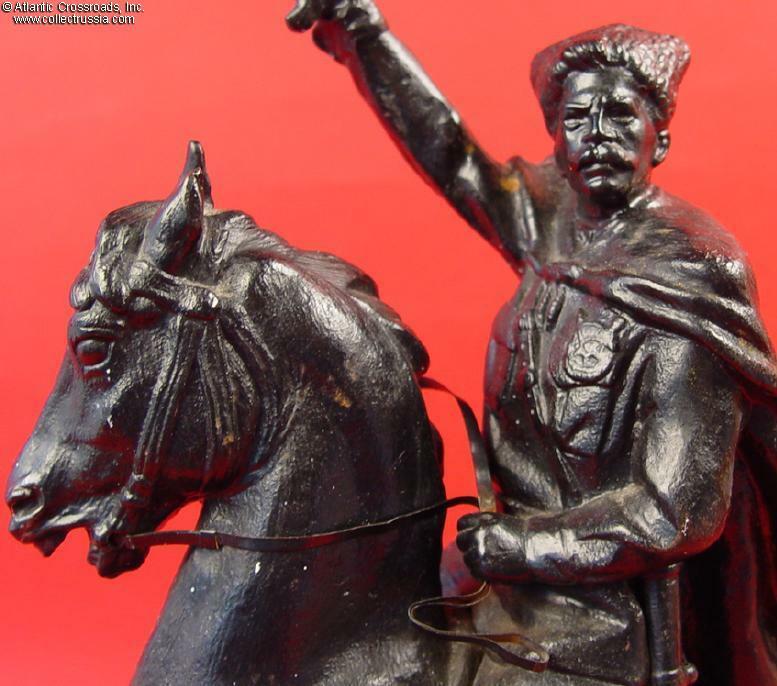 For more Stalin statuettes, please visit the Sculptures of Lenin & Stalin, section of our website. $1,100.00 Massive Standing Statue of Sergei Kirov in Cast Iron, manufactured by KhLM Factory, Moscow in 1960s-70s. Measuring 22" tall and weighing 28 lb, this rare model of a monument to a slain Bolshevik leader can become a unique focus point for the advanced Soviet collection. The huge original monument is still standing in the city of Kaluga near Moscow. $425.00 Kasli cast iron sculpture of horsemen, dated 1961. High quality Soviet decorative artwork standing an impressive 11" tall. $90.00 Cossack Man and Woman Bidding Farewell (aka Farewell Kiss or Farewell of a Cossack), a 1977 cast iron sculpture after a famous model by the acclaimed XIX C. sculptor Evgeniy Lansere. A very complex equestrian group by the Kasli Iron Works. Missing a small part and repainted, but very impressive nonetheless, this fine decorative item of Soviet era can be a focal point of a Russian display at a small fraction of the cost of pre-revolutionary casting. $150.00 Black Sea Sailor or Naval Infantryman in desperate hand-to- hand combat against the Fascists. Cast iron sculpture, dated 1979. $195.00 Attractive Cast iron Kasli statuette depicting a decorated Red Army soldier returning home to his daughter. Dated 1986. $90.00 Young Footballer (Soccer Player) statuette, Kasli, 1976. This elegant cast iron piece shows "Made in the USSR" mark beside the foundry mark at the bottom, indicating higher quality goods suitable for exporting. Stands 7¼" tall. $90.00 Tennis Player, cast iron figurine by the Kasli Iron Works, dated 1961. An inspired rendition of a female athlete. The tennis racket has been replaced or repaired, but the statuette still looks very impressive. Stands 7" tall. $750.00 Maya Plisetskaya, very large cast-iron figurine by the Kasli Iron Works, dated 1984. A lovely portrayal of a Soviet icon, this figurine captures all the grace of the famous ballerina. Excellent condition. Stands 19.5" tall. $110.00 Young Dreamer (Boy with a Toy Space Rocket), cast iron figurine by the Kasli Iron Works, 1964. This statuette evoking the new generation of future cosmonauts comes from the era of the early Soviet triumphs in space. Measures over 8" in overall height. $180.00 She Got Lost (aka Girl with a Wicker Basket), cast iron figurine by the Kasli Iron Works, 1963. Stands 8 3/4" tall. This early work by sculptor Venkova is relatively scarce: rated R2 for rarity in the "Cast Iron Art" catalog by A. Zak. $120.00 Schoolgirl with a Kid Goat, cast iron figurine by the SChLZ (Sverdlovsk Iron Works), late 1950s - early 60s. A relatively small but complex piece by a less common manufacturer. $50.00 Little Boys with a Book, cast iron figure, circa 1950s. Unmarked, possibly SChLZ manufacture. Measures 4 ¾" in width. A very uncommon piece! $975.00 Schoolgirl with a book, cast-iron figurine by the Kasli Iron Works, dated 1957. A quaint and relatively rare statuette of massive size: stands 19.5" tall. Excellent condition. $60.00 Chicken, cast iron figurine by the Kusa Iron Works, circa 1970s. A hatchling standing next to its broken shell is exuding almost comical confidence. A fine quality figurine by a less common Soviet cast iron maker. $600.00 "Dogs Pointing", Large Statuette in Cast Iron by the Kusa Foundry, dated 1970. Based on the work of Pierre-Jules Mene, a XIX C. French sculptor highly acclaimed for his masterful portrayals of animals and hunting scenes. Massive piece measuring over 15" in length.